The CT540 WiFi Cable Package is used to provide RF isolated connections between RF devices for a more controlled RF test environment. Additional external shielding e.g. RF isolation chamber, might be require to totally isolate the SUTs (Systems Under Test) from interference. Typical use would be to directly connect a LANforge WiFIRE system with external RP-SMA antenna connectors to other devices with SMA connectors, such as an AP. 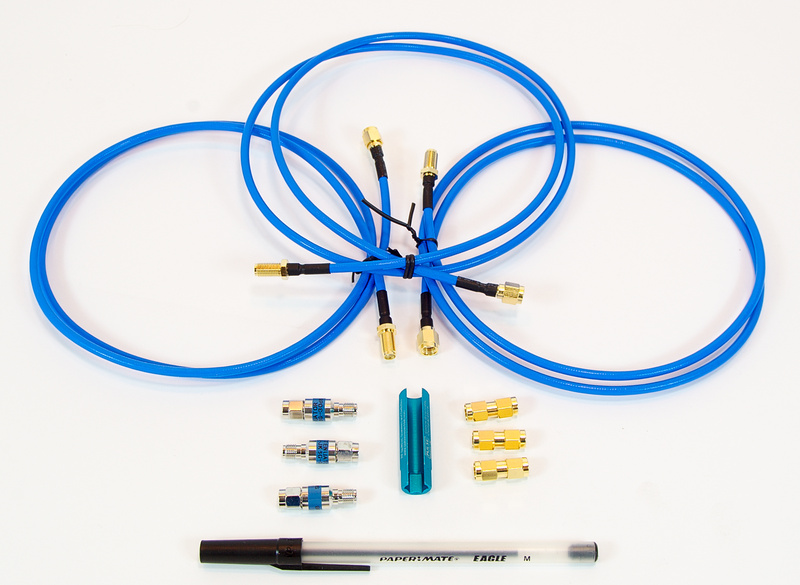 This package includes 4 semi-rigid SMA cables, 4 fixed 30dB attenuators, 4 SMA adapters, and one SMA cable wrench. This provides everything needed to connect one LANforge radio to a standard AP with SMA adapters. Multiple packages will be needed to connect additional LANforge radios. Attenuators are required when connecting LANforge to SUT with SMA cables because the signal level will otherwise be too high and potentially damage equipment and cause poor performance. 3-meter cable packages are also available for a small additional fee. 4 x 1 meter semi-rigid 670-141 cables. 4 x 30 dB fixed attenuators. Weight: 1 lbs or 0.45 kg.